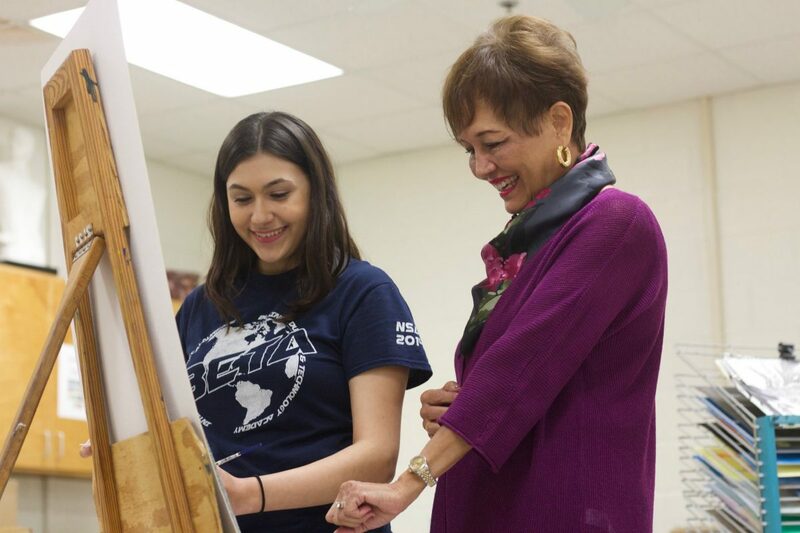 STISD Superintendent Dr. Marla Guerra looks at an art project with a student from the district. McALLEN — After 17 years leading South Texas Independent School District, Superintendent and long-time educator Marla Guerra announced her retirement. “It’s bittersweet because I love my job and we have a wonderful district in South Texas, and the people I work with are phenomenal, our board is phenomenal, but ultimately I needed to make a decision and I did,” Guerra said. 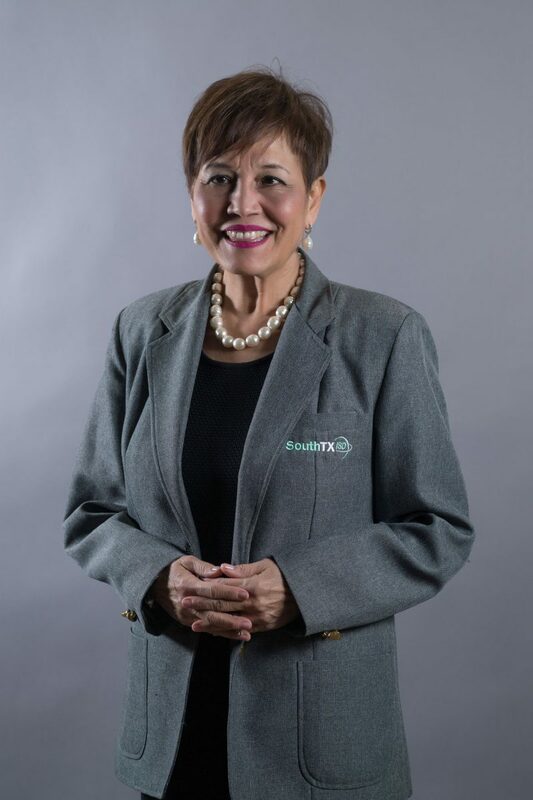 Guerra took over the leadership role at South Texas ISD in 2001 and her retirement was approved by the board of directors during a meeting last week. Her official last day in the leadership role is yet to be decided, as she agreed to remain on board until the district finds her successor. The decision to leave the district was not easy, she said, as she has seen the district evolve over the years. But the leading role, although rewarding, wasn’t leaving her much time to enjoy her family. 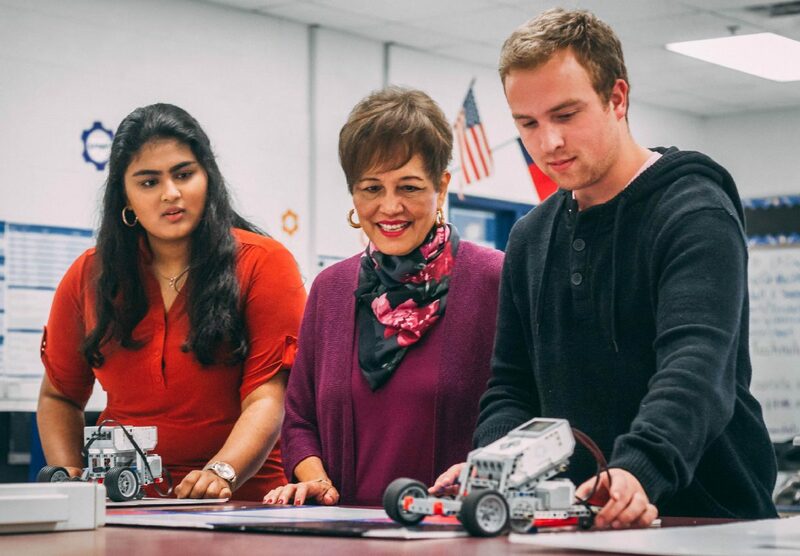 STISD Superintendent Marla Guerra looks at a robot with two students from the district. Guerra has served in education for more than 40 years in numerous roles including as a teacher, principal, assistant superintendent, superintendent and college professor. Her main mission in all of these roles, she said, was to make a difference in somebody’s life and encourage them to never give up on their goals and dreams from the moment they are students in her classroom, to the moment they come to her as professionals seeking advice to move up the ranks. During her tenure at the South Texas school district she sought to increase the academic offerings and partnerships outside the district in order to offer students more hands-on experience with local businesses and added educational opportunities with local higher education institutions. Guerra said her ties to education might be hard to completely cut at this point and hopes to find ways to stay connected by working as a consultant or volunteering her time with education organizations. The South Texas ISD board of directors will be hiring a search firm to help with the transition, but Guerra said there is no timeframe yet as they want to take as much time as needed to find the right candidate.